LIBOR stands for "London Interbank Offered Rate." For a long time, it was probably most common benchmark interest rate in the world--that is, it was the built into trillions of dollars worth of loans and financial contracts that if the LIBOR interest rate went up or down, the contract would adjust accordingly. However, a huge scandal erupted back in 2010. Turns out that the LIBOR was not based on actual market transactions; instead, LIBOR was based on a survey in which someone at a bank gave a guess on what interest rate their bank would be charged if the bank wanted to borrow short-term from another bank on a given morning, in a particular currency. A few of the people responding to the survey were intentionally giving answers that pulled LIBOR up just a tiny bit one day, or pulled it down a tiny bit another day. Given that the LIBOR was linked to trillions of dollars in financial contracts, market traders who knew in advance about these shifts could and did reap fraudulent profits. LIBOR tightened up its survey methods. But it clearly made sense to shift away from using a benchmark interest rate based on a survey, and instead to use one based on an actual market for short-term low-risk borrowing. Various committees formed to consider options. 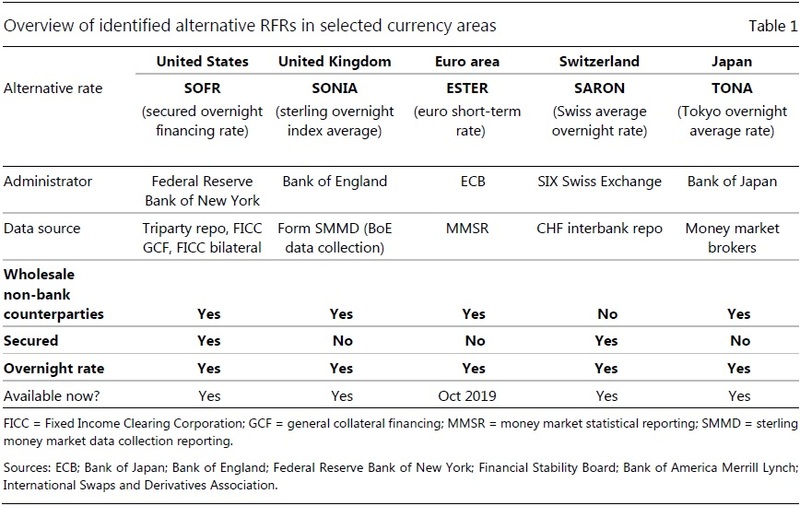 As I noted here about six weeks ago, the US is switching from LIBOR to SOFR--the Secured Overnight Financing Rate. I wrote: "It refers to the cost of borrowing which is extremely safe, because the borrowing is only overnight, and there are Treasury securities used as collateral for the borrowing. The SOFR rate is based on a market with about $800 billion in daily transactions, and this kind of overnight borrowing doesn't just include banks, but covers a wider range of financial institutions. The New York Fed publishes the SOFR rate every morning at 8 eastern time." But what about the switch away from LIBOR in the rest of the world? Andreas Schrimpf and Vladyslav Sushko describe what's happening in "Beyond LIBOR: a primer on the new benchmark rates," which appears in the March 2019 issue of the BIS Quarterly Review (pp. 29-52). 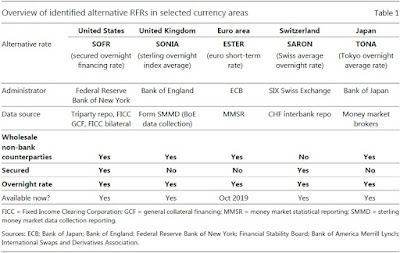 Here's table showing the alternative risk-free rate (RFR) benchmarks being used with other currencies. There are several big issues ahead in this area. One is that the LIBOR is actually going to be discontinued in 2021, so any loan or financial contract with a benchmark rate will have to migrate to something else. There will be literally trillions of dollars of contracts that need to shift in this way. Moreover, the LIBOR debacle has made a lot of financial industry participants think more carefully about exactly what benchmark interest rate may be appropriate in any given contract--for example, an appropriate benchmark might include not only an overnight risk-free rate, but also some built-in adjustment for other kinds of risks, including risks over different periods of time or risks at the firm or industry level. For most of us, discussions of benchmark interest rates have a high MEGO (My Eyes Glaze Over) factor. But when I think in terms of trillions of dollars of loans and financial contracts around the world, all being adjusted in ways that are thoughtful but untested, I find it easier to pay attention to the subject.